Powerful ThinManager® Ready Thin Client with five display support ideal for control rooms. ThinManager® Thin Client Management Software offers a streamlined solution for any industry, providing terminal server and thin client management that's flexible and powerful. With advanced security and a wealth of advanced features including shadowing, MultiSession, and failover support, as well as easy integration with Citrix and VMware, the ThinManager®-ready TM610 (requires ThinManager 11 or higher, and Firmware Package 9) is designed for maximum performance and discreet, reliable operation. The TM610 features a ThinManager® BIOS, providing an economical and powerful thin client virtualization solution. 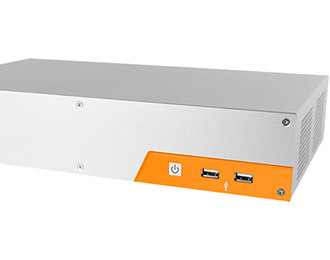 No matter the application, this embedded thin-client has the power to stand up to any task. 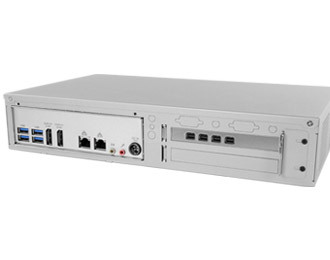 Featuring a powerful and efficient Intel Coffee Lake Celeron, Pentium, or up to Core i3 processor and a 12 VDC/19~28 VDC input, the TM610 is ideally equipped for installation at individual workstations or terminal management from a centralized control room. 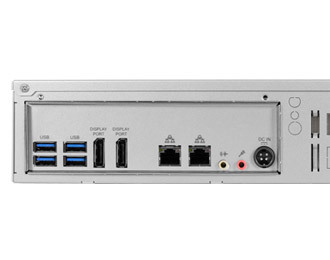 What sets the TM610 apart is its support for up to five 1080p displays using the system's 4 Mini DisplayPorts and any one of the other onboard video outputs. Fast, discrete Nvidia Quadro graphics allow you to manage your entire network simultaneously. The TM610 is enclosed in a mini-ITX chassis designed to be tough enough for embedded commercial applications, yet sleek enough for desktop use. Double right angle folds reduce EMI and improve EMC performance while cross-case ventilation keeps fan noise low and the system operating 24/7. Optional wall, DIN, and VESA mounting allow secure mounting on virtually any vertical or horizontal surface. Combine all of this with the features of the proven ThinManager® platform, and the TM610 is one of the most powerful and versatile thin-client systems on the market.